One Spring Forward done. Woo!?! Also pictured is the progress on Crusoe and last year’s SoS second sock. I’m plugging away on the soul sucking plain stockinette socks while others decide my fate. Right now, the poll is tied for working on on the stockinette of doom and starting the second Spring Forward. So, if anyone wants to go in and vote, (for say starting a new sock all together) feel free to. Luckily, Texas is working all weekend, so I have had time for knitting. Between turkey relocation and breaking the phone in my cleavage (not really, but we’ll just let her think that). I’m back to a phone I bought 4 years ago. I’m affectionately calling it the Fisher Price phone. I gave my new-old one a try this morning and if it works again tomorrow, I’ll reactivate it. I mean, it’s running on 3G. I can’t even twitter from it!!! I know, first world problems and all that. Happy Sunday people! What are y’all doing today? I wasn’t joking about the pigs either. I couldn’t introduce the newest additions until I had the names solidified. Eggs was instant, but we went through Cobbler, Pancake, Muffin, Toast…yadda, yadda. Yeah, I have a very weird sense of humor when it comes to naming livestock. We’ve had a series of jailbreaks/attempts/evading arrests around here recently. Last night, we had a baby turkey in the closet. Well, former closet. Now it’s just kind of an alcove where the closet wall used to be and the as yet to be installed (still boxed) dishwasher is being stored. This morning, while changing water and feeding, another decided to flee while my back was turned. I suspect it was the same one. If it wasn’t lightning up a storm, I’d be hauling metal water troughs around and getting them set up in the barn. But, you know, there is that whole fear of being struck by lightning, soooooooo, um, no. We kept the calves in this morning (see above re: lightning) because well, they’re kind of stupid when it comes to coming out of the rain. Bacon is too young to risk getting all wet and pneumonia-y. I can hear them rattling the cattle gate chain trying to stage their own jailbreak. 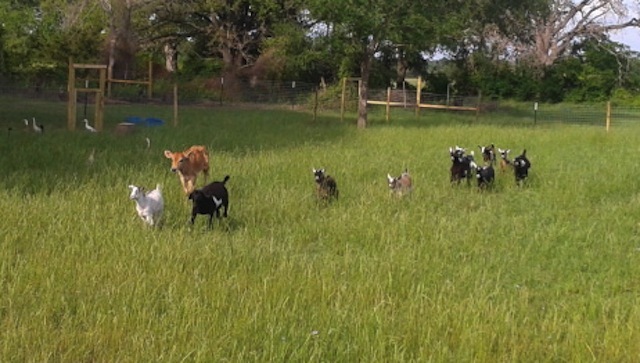 It could be because the goats are frolicking around and teasing them. We won’t even talk about the sneaky goats and wily geese. I think I have a group of misfits over here. At least this rain is giving me an excuse to knit and avoid driving nine million miles for blood work. I may even use it as the reason I take a nap later. Meet Bacon! (I typed meat first, which technically…) He’s a 4 week old Jersey that we’re going to sell in the fall. Don’t you just love that little heart on his forehead? For all the complaining about the work that goes into starting/ having a farm, there is something cool about being able to barter a couple of chicks, some ducks, 6 turkeys and 6 rabbits for a cow and two pigs. I briefly considered 2 Jacob sheep instead of all that, but it makes more sense financially to go with the calf and pigs for right now. Plus, it would be a whole new learning experience. At least Texas and Boomhauer* have a bit of experience with pigs. That’s what I did yesterday. Along with getting feed, stocking up on gas for the tractor (I really need a gas tank on my truck), getting a flat and being treated like a helpless woman twice. Bless their hearts. They were both older gentlemen and it was very sweet and I am appreciative. I’m just used to getting things done and not always relying on someone to “save me”. I mean, I had my first job at 13 and my own checking account at 16. Before that it was one of those Passbook savings accounts. Do they still have those? Are any of you old enough to remember them? Or is it just me? Anyway, no sock knitting occurred yesterday, but wait until you see what I did accomplish this week. * Boomhauer is our “neighbor” who actually lives about a half mile or so – not counting the driveways- away. His acreage is across the road from ours and it is often his horses that are wandering around. I can only understand about one word in twenty when he is speaking. Between the thick East Texas accent and the oil field accident that messed up his face, I’m lucky I get that far. I totally need Texas to translate. I always get such an awesome reception when I have the feed bucket in my hand. I wasn’t liking the fabric that I was getting from holding two strands of yarn together. I came up with the idea of crocheting a chain with two held together and then using that chain as my yarn. The Voice of Reason said it was cray-cray and Cockamamie Woman said it was an awesome idea. Please remember that in this equation, she is the voice of reason. This will be my last Mega May thing, so I want it to be excedeingly mega. That would probably mean doing the whole crochet thing, huh? Which actually is kind of crazy. I wonder if Texas can make me and insanely sized hook today. Apparently, the chickens really liked that I brush hogged the big paddock this morning. Author stacey919Posted on May 19, 2013 Categories UncategorizedTags 42Farms, CMMDI13, farm, Knitting, life, Random Shit7 Comments on Fooooood! I finally understand the whole “my hands just hurt looking at that” thing. The piping on 35’s was painful. Definitely easier and less painful on 50’s and 120’s. I was thinking I might (and that’s a big might) make my next mega project that pair of socks I started for SoS ’12. Mega because they’ve taken mega-long and I keep thinking about how they should be finished before the next SoS, so they’re like a mega thorn in my side. I could just crack open that box of yarn from Elann and start knitting something else on the big needles. I think I was thinking about this blanket when I ordered it. Or, I could wait for my Giants (40″ US120’s) from Go-Girl to get here and start the Really Big Rug of Doom! Did I mention that crazy Nacogdoches has started knitting a blanket or rug or something out of bed sheets with her needles? O.o If I start asking for old sheet donations, please send an Intervention Team. Oh, hell, just send one anyway. Have I mentioned that they sent me the shipping notice for the 15 turkeys? They’re all heritage breeds, untouched by genetic modification. No, I wasn’t expecting to order 15, but there was this whole “minimum order amount” thing. I wonder what baby turkeys sound like. Do you think they’ll gobble right away? Author stacey919Posted on May 16, 2013 Categories UncategorizedTags 42Farms, CMMDI13, farm, FO's, Knitting5 Comments on Mega-licious! Did you know that cows will cry for their babies if you take them away? It happened at the neighbor’s place yesterday morning. The truck had about 20- 30 calves on it. At first it was sad hearing them cry. And then they kept.doing.it. Take a moment and imagine it, 20-30 momma cows bellowing for over 24 hours. 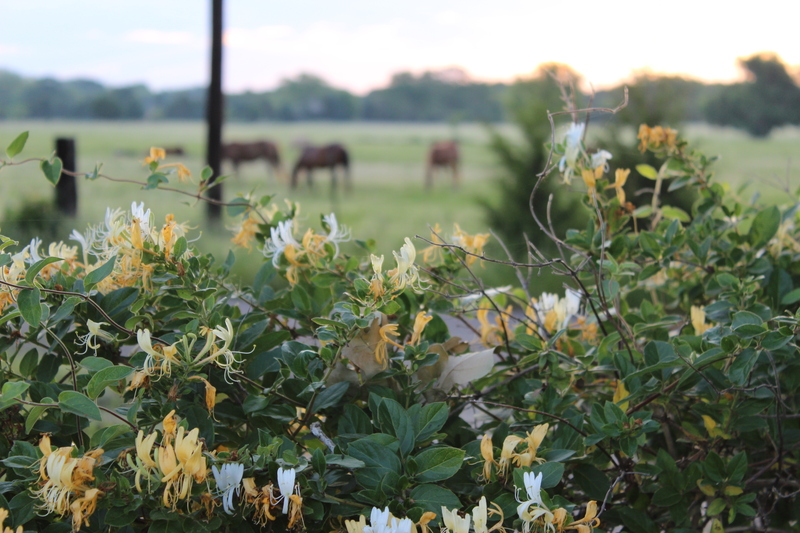 But then you also have fence-rows full of honeysuckle. With horses in the background. I had the wrong lens with me, or I could have gotten some better pictures of them frolicking. 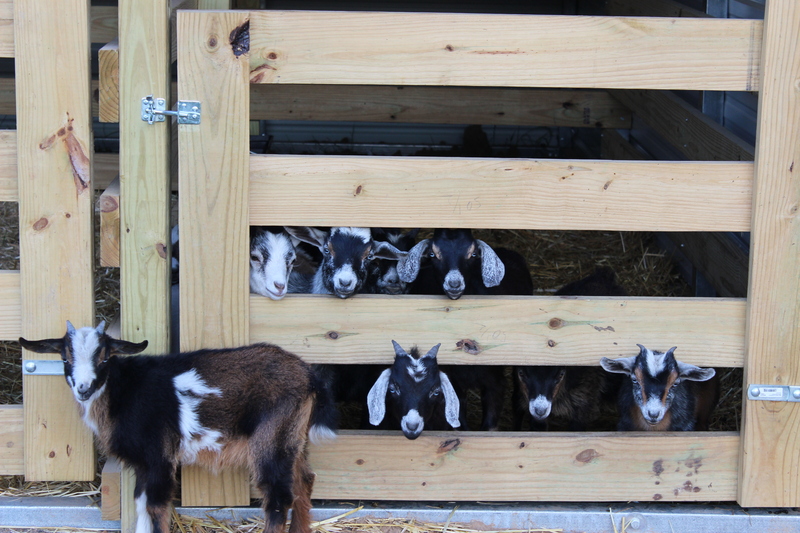 Or adorable goats. Including Ernest the Escapee. He spends his evenings curled up with Cheddar. If we don’t get to the pens early enough, he’s usually outside teasing the other goats. In Mega May news, I got nothin’. Well, nothing finished. You would thing with the huge 35’s that I’d be done by now. I suppose I could have been, but I’ve been “enjoying” my alone time by preparing for at least 23 day old birds (turkeys and geese), gardening and playing with baby bunnahs. The only really fun part of that last sentence was the baby bunnah thing. At least my Mega May thing doesn’t have a deadline. What are you doing for Mega May?